Our new tradition of flying to Hawthorne on Christmas Day also includes hosting a Boxing Day supper the next day. This year it was a family affair with folks coming from Montclair, Albany and Troy. 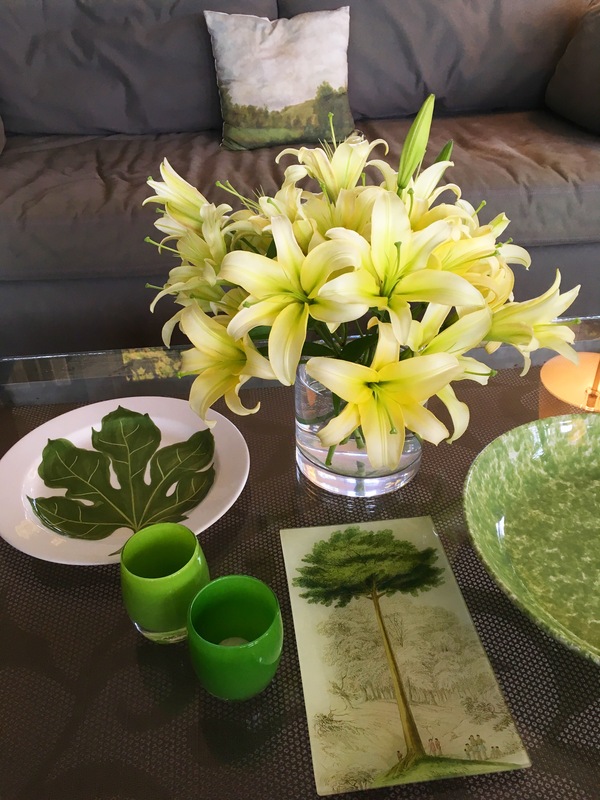 Simple potted paperwhites would be the centerpiece of the table. When we bought the metal topped dining table when we first got the house, we actually bought 2. The legs fold so we keep the spare in the basement. It is quite nifty because it saddles up ever so nicely as a pair, giving us lots of extra seating to accommodate more guests. 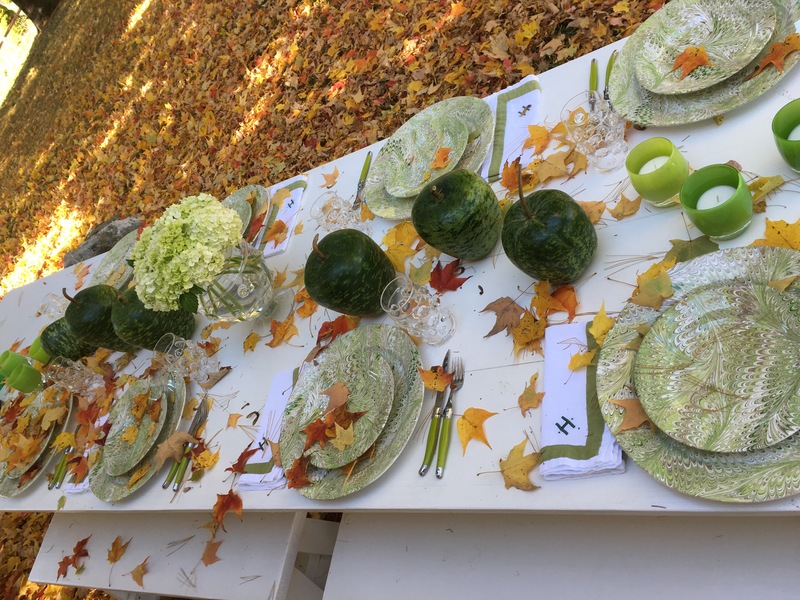 We used 2 fern laden matching tablecloths so the tables became a cohesive whole. 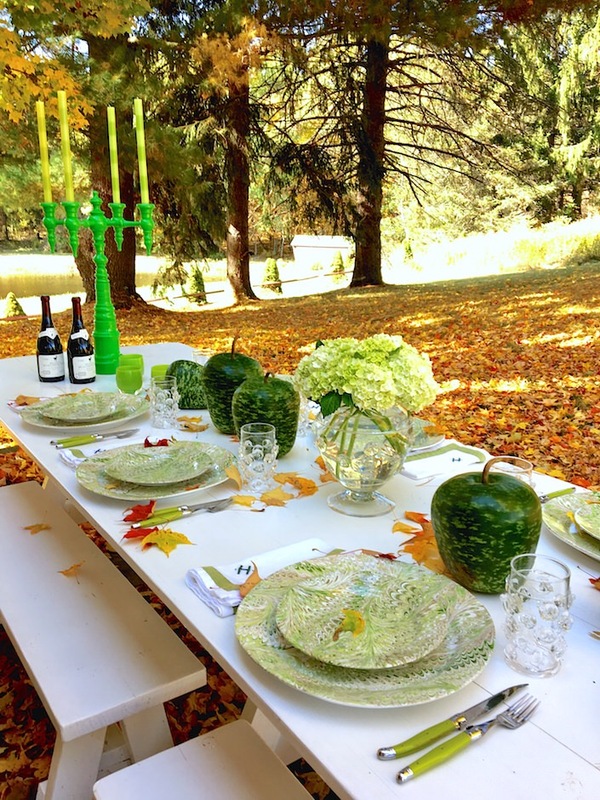 Then it was a smattering of glassybaby vessels along with the pair of jaunty green Dunes & Duchess candelabras and we were off and running. Citrus with thyme salmon, cauliflower and broccoli purée, along with Parmesan smashed Yukon gold potatoes was the meal. Tons of chatting, lots of laughs, deep discussions and a good deal of wine. A pretty swell evening to kick-off our stay. 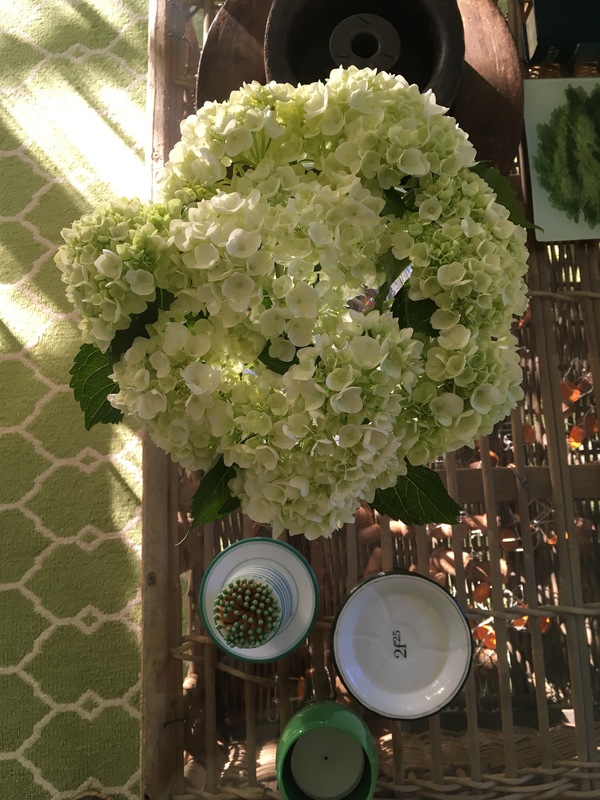 Over the moon pleased to announce that the At Home video with Susanna Salk on the Quintessence blog by Stacey Bewkes is now up. Head on over and check it out if you please. 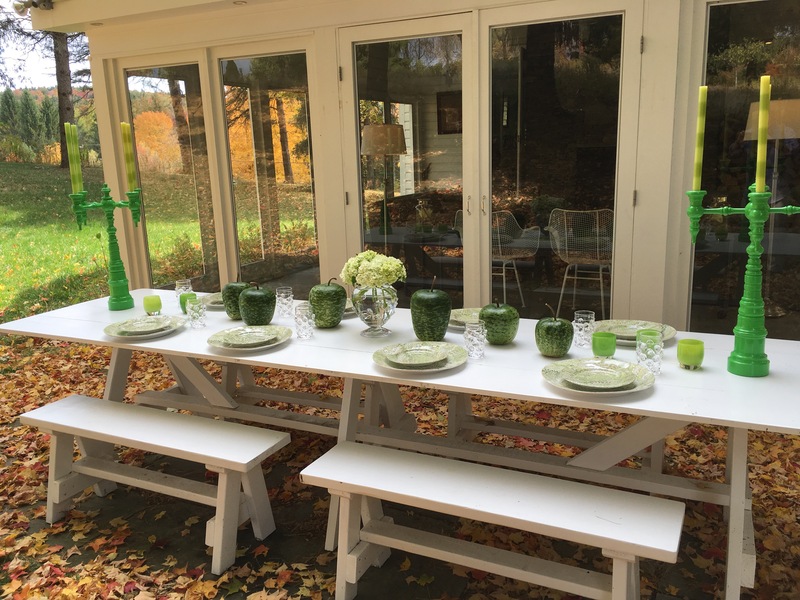 It is such a lovely reminder of an incredibly gorgeous October Hudson Valley day. It snowed a bit this morning in Seattle so it was fun to see the video where it was so sunny and the leaves falling about from the trees. I think you might remember me writing about this a few months back. It had been pretty cool most of our stay and a bit rainy. I was crossing my fingers big time for a pretty day as I was setting the long picnic table outside the back porch for a meal. Well, I got what I was hoping for in spades. It was a gloriously sunny day. Actually hot, as it hit 82 degrees. I mention this as my shirt remained untucked throughout the video as I was running a tad warm. Also funny Bailey sidenote. TPS was away the day this was shot, visiting his brothers. Bailey would not stop barking in several of the shots so I held her a bunch, hence me holding her to keep her quiet. Just funny little behind the scenes details–I could not be happier with how it all turned out. Stacey & Susanna are real pros and put it all together so wonderfully from start to finish of this entire project. Cheers to them! 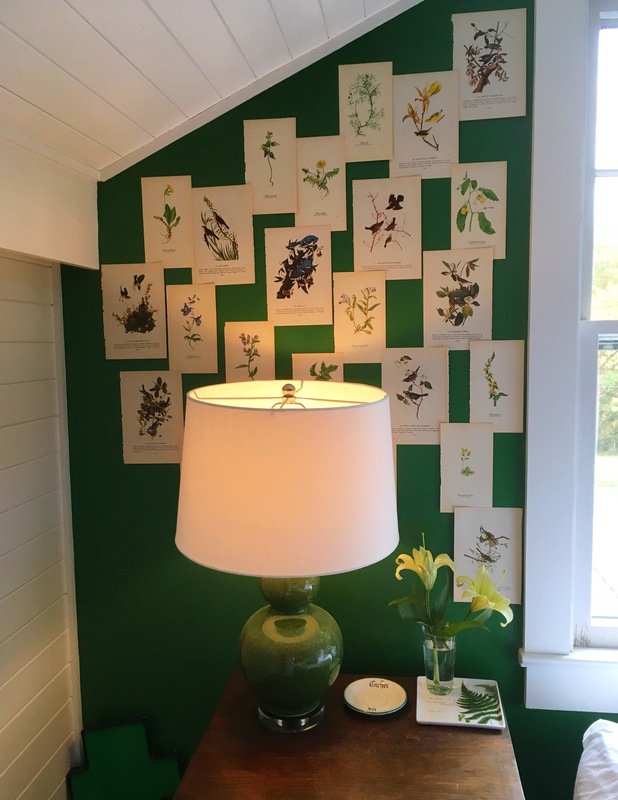 Thanks to Benjamin Moore paints for sponsoring all the greens throughout the house on the walls. 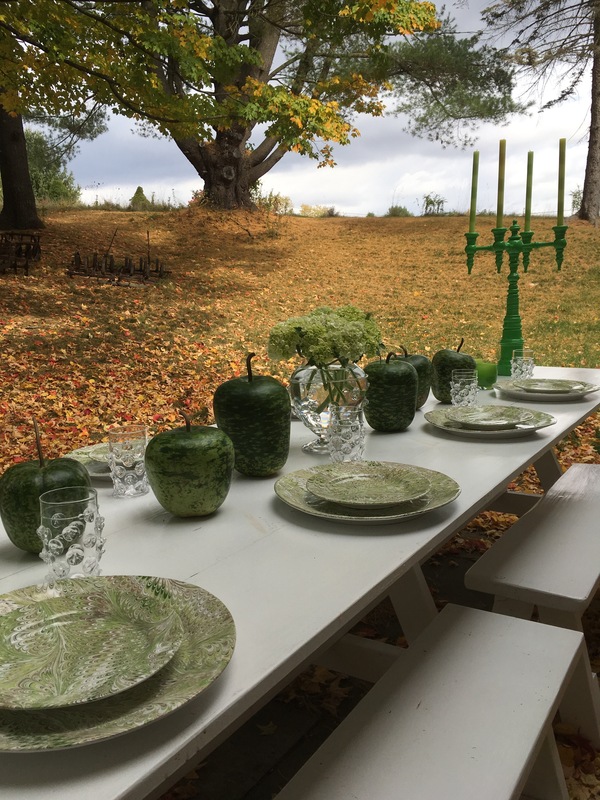 Juliska for all those beyond gorgeous plates and glassware on the outside table and to Dunes and Duchess for getting the 2 big green candelabras made for us so quickly and so beautifully. 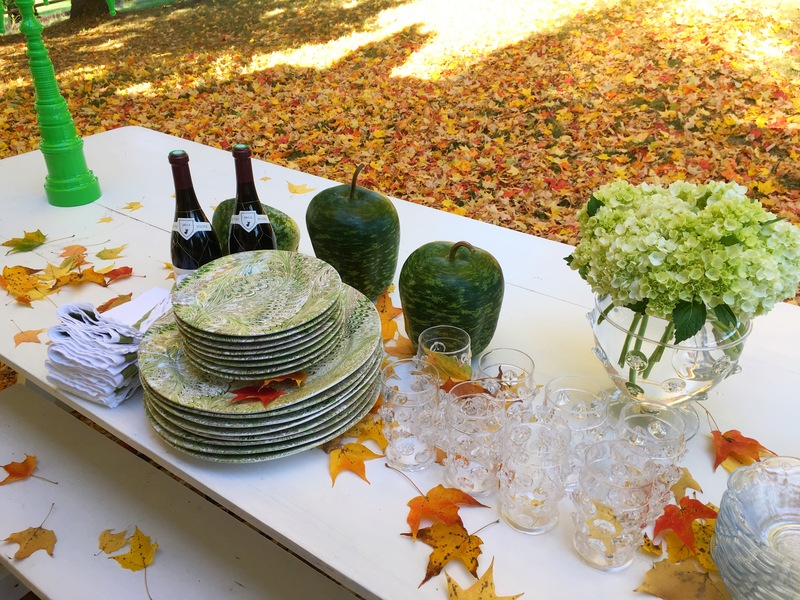 Cheers to the Hudson Valley! Click here to watch the Hawthorne house tour video. Be careful of what you ask for, is something I can hear my dad say often. I had hoped for good weather for the photo/video shoot yesterday and received it in spades. 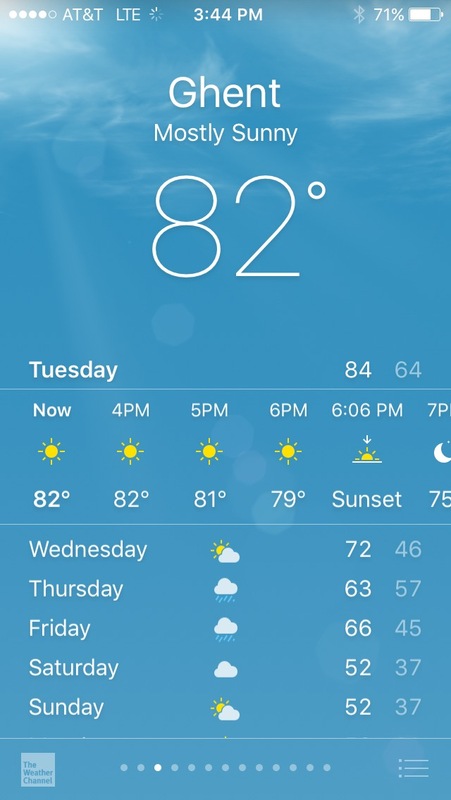 My oh my, 82 degrees and stunning. The funny part is I had brought one of my all-time favorite shirts to wear, a flannel Burberry with bits of green running through it. 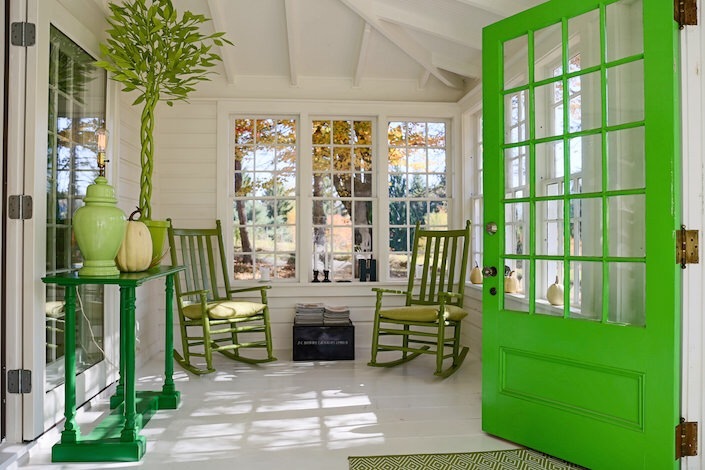 To pull out the green of my slip-ons that pulled the whole ‘Ghent Green’ look of the house together. Please know I am laughing myself silly thinking/typing this. Minute details are what make me happiest. But a flannel shirt in 80+ degree weather was just not going to cut it. So I quickly pulled out one of the few long sleeved shirts I had pressed and away we went. I felt a tad, ok a lot, sweaty, the entire shoot. Between running around making sure things were photo ready and cooking up a storm, I was not as ‘pressed’ as I like to be. That aside, it was just a blast from start to finish. Stacey & Susanna are pros and had the entire shoot mapped out within minutes of walking around the house. Oh, one other very funny detail that must be mentioned before the video comes out which added to my sweaty-ness. Mister Sive was away spending a few days with his brothers at the Sive family farm in The Catskills. So I was flying solo, with watching Bailey and making sure she did not dart out an open door or get underfoot. Well, she most certainly did not. She would not leave my side and chose to bark if I did not pick her up. SO, not only was I a tad sweaty, ok a lot, I was also holding a dog in most of the shots. Again, I am laughing so hard tears are streaming down my face from the memory. A middle-aged gay man holding his small dog while showing you the details of how to use double stick tape to make a nifty art installation. I write this all to share some of the behind the scenes details that usually never get shared when you read/see things on people’s homes. Truly, it all could not have been more fun and I know it all turned out swell–it is just fun to share a few funny life elements that go into a photo shoot or making of a video. Stacey’s post and the video will be up at the end of November. I will write again about it all then to give you a heads up when it is running. 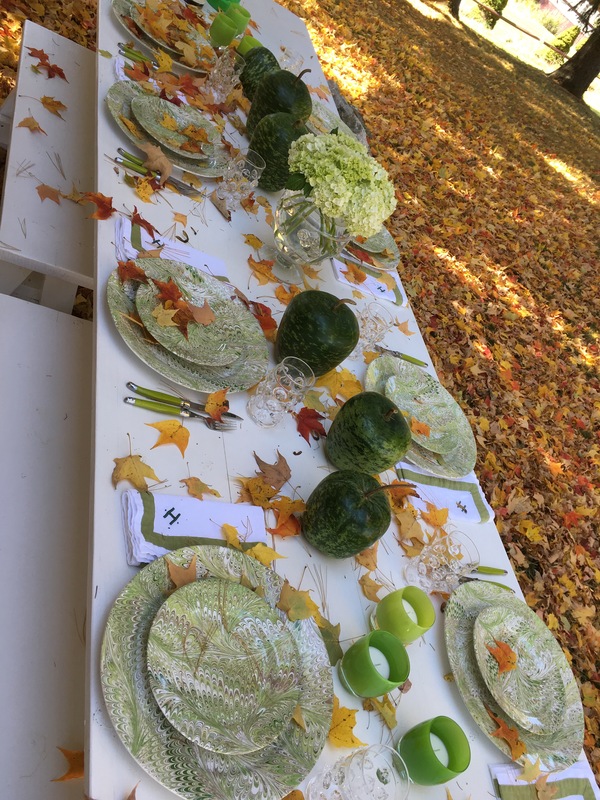 These photos of the picnic table I set out back–with the leaves falling about as I set each spot. The whole experience was just magical, non-Burberry shirt and all. 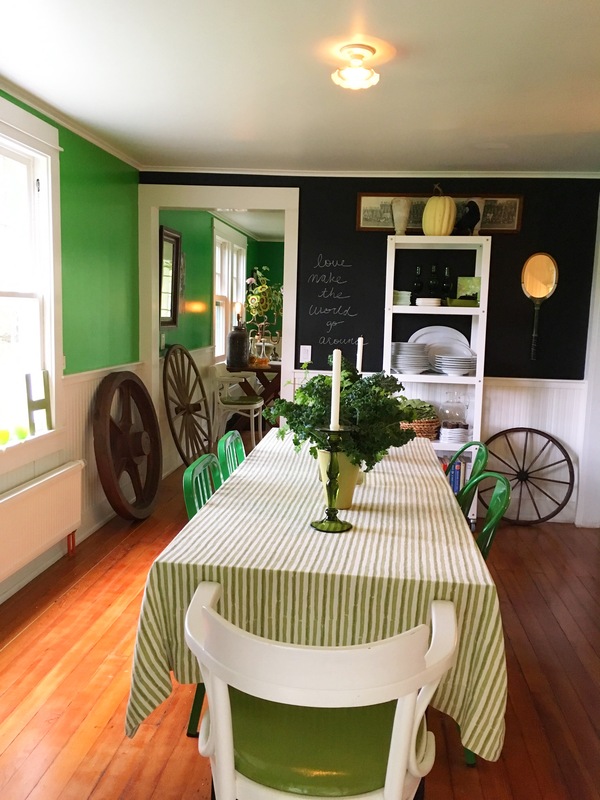 Today a fun day awaits, as Stacey Bewkes from the video series & blog Quintessence along with author Susanna Salk are coming to Hawthorne to film a segment for an upcoming video as well as photograph the house. The above & below the beginning stages of the table I am setting out back. The leaves creating a carpet that I so love. A country supper of roasted chickens stuffed with herbed chèvre along with an assortment of root vegetables is on the menu. I will post more later this week, but thought I would give you a look at the start of the table. It is supposed to be 80 degrees today, so a crisp Hudson Valley day it will not be. Warm or chilly, it will be a blast. Happy Tuesday all!